The article Important Banking Interview Questions provides important interview questions and answers for some bank related exams like IBPS SO, IBPS PO, IBPS Clerk, etc. The article Important Banking Interview Questions can help the aspirants to face the interview with proper knowledge. After clearing the written exams, some aspirants were not able to perform well at the time of interview. Due to the insufficient knowledge of interview session or some fear the aspirants were not able to give their best in the interview sessions. So, the main aim of the article Important Banking Interview Questions is to provide some awareness about the interview questions. RTGS stands for real time gross settlement, which means that it enables money to move from one bank to another on a real time and gross basis. Simply put, real time means the beneficiary bank receives the instructions for fund transfer immediately and gross means that it is not bunched with any other transaction and settlements of funds transfer instructions happen individually. Since the funds settlement takes place in the books of the Reserve Bank of India (RBI), keep in mind that the payments are final and irrevocable. Neft stands for National Electronic Funds Transfer and is a payment system which facilitates one-to-one funds transfer. Like RTGS, Neft also transfers funds from one bank, but unlike RTGS the settlement takes place in batches (that may include transfers from various individuals) rather than individually. The batches are settled in hourly time slots. 4. How is RTGS different from NEFT? Timing : As mentioned above, Neft operates in hourly batches. Currently, it has 11 settlements from 9am to 7pm on weekdays and five settlements from 9am to 1pm on Saturdays. So, in case you initiate a transaction after a settlement time you have no option but to wait till the next settlement time. But that’s not the case with RTGS transactions, since they are processed constantly throughout the RTGS business hours. The service window for RTGS at banks is available from 9am to 4.30pm on week days and from 9am to 1.30pm on Saturdays for settlement at the RBI end. Keep in mind that the timings that each bank follows may vary. Amount : As far as Neft goes, it does not have a minimum or maximum limit of amount you can transfer. But the maximum amount per transaction is limited to Rs 50,000 for cash-based remittance and remittance to Nepal. As far as RTGS goes, it is mostly meant for large transactions. The minimum amount that can be remitted through it is Rs 2 lakh. RTGS does not have an upper ceiling for transactions. Charges : For Neft, inward transactions (when you receive funds via Neft) are free, as no charges are to be levied from the person to whom fund are being transferred to. When you use Neft to make an outward transaction (when you send funds via Neft) at a bank branch for amounts up to Rs 1 lakh, the charge is up to Rs 5 plus service tax. For transactions above Rs 1 lakh and up to Rs 2 lakh, the charge is up to Rs 15 plus service tax. for transactions above Rs 2 lakh, the charges can’t exceed Rs 25 plus service tax. For RTGS, inward transactions (when you receive funds through RTGS) are free. For outward transactions (when you send funds via RTGS), if the amount is between Rs 2 lakh and Rs 5 lakh, the charges will be up to Rs 30 per transaction. If the amount transferred is above Rs 5 lakh, the charges can’t exceed Rs 55 per transaction. 5. What is Golden Slam? A player who wins all four Grand Slam tournaments and the Olympic gold medal during his or her career is said to have achieved a Career Golden Slam. Serena Williams is the only player to have achieved a career golden slam in both singles and doubles. 6. What is the ‘Quick Ratio’? 7. Difference between Nationalized banks & Private bank? 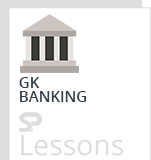 A public sector bank is a bank in which the government holds a major portion of the shares. Government holdings are more than 50% in public sector banks. Private sector banks are owned by private lenders. The private banks are managed and controlled by private promoters. KYC Stands for “Know Your Customer”. The objective of KYC is to enable banks to know and understand their customers better and help them manage their risks prudently. The process of KYC entails identifying the customer and verifying the identity by using reliable and independent documents or information. Commercial bank’s balance sheet has two main sides i.e. the liabilities and the assets. From the study of the balance sheet of a bank we come to know about a system which a bank has followed for raising funds and allocation of these funds in different asset categories. 9. Difference between Liabilities & Assets of a bank? 10. What is Financial Inclusion? Given the evidence that financial access varies widely around the world, and that expanding access remains an important challenge even in advanced economies, it is clear that there is much for policy to do. The need for coordination on collective action, and concentrations of poor people, mean that banks in India everywhere have an extensive role in supporting, regulating, and sometimes directly intervening in the provision of financial services. a) Financial literacy – Providing financial literacy is the core function of financial inclusion, as the main reason for exclusion is the lack knowledge about formal financial system. Financial literacy refers to knowledge required for managing personal finance. The ultimate goal is empowerment of people to take action by them that are in their self interest. b) Credit counseling – There are two types of credit counseling, one is preventive counseling and the other is curative credit counseling. Preventive counseling will include bringing awareness regarding cost of credit, availability of backward and forward linkages, etc., need to avail of credit on the basis of customer’s repaying capacity. In case of curative counseling the credit counseling center will work out individual debt management plans for resolving the unmanageable debt portfolio of the clients by working out effective debt restructuring plan in consultation with branch of the bank, taking into account income level and size of the loans. c) BC/BF model – With an effort to focus commercial banks, to reach rural household and farm household, banks were permitted to use infrastructure of civil society organizations, rural kiosks, and adopt Business Facilitator (BF) and Business Correspondent (BC) models for providing financial services. d) KYC norms – In order to ensure that persons belonging to the low income group both rural and urban areas do not encounter difficulties in opening bank accounts, the Know Your Customer procedure (KYC) for opening bank account was simplified asking banks to seek only a photograph of the account holder and self certification of addresses (the amount of outstanding balance in these accounts would be limited to 50000 rupees and total transactions would be limited to one lakh rupees in one year. e) KCC/GCC Banks were asked to introduce a general credit card (GCC) scheme for issuing GCC to their constituents in rural and semi-urban areas based on the assessment of income and cash flow of the household similar to that prevailing under normal credit card without insisting on security and the purpose or end use of credit (as Point Of Sale-POS and ATM facilities) with similar products are not feasible or available and limited infra structure in rural areas. The limit under GCC is up to 25000 rupees. Banks were advised to utilize the services of Schools, health,etc. f) No-frill accounts Financial literacy – In November 2005 RBI advised banks to make available a basic banking “No-frill Account” with low or nil minimum balances as well as charges to expand the outreach of such accounts to vast sections of the population. a) Users to perform banking transaction using mobile phone like balance checks, fund transfers, bill payment etc. d) To pay goods at merchant location point of sale. 12. What is Plastic Money? Plastic money is a term that is used predominantly in reference to the hard plastic cards we use everyday in place of actual bank notes. They can come in many different forms such as cash cards, credit cards, debit cards, pre-paid cash cards etc. 13. Difference between Demand Draft & Cheque? Cheque and Demand drafts (DD) are both negotiable instruments. Both are mechanisms used to make payments. Demand Draft is a pre-paid Negotiable Instrument, where in the drawee bank acts as guarantor to make payment in full when the instrument is presented. Cheque is issued by customer Demand draft is issued by the bank. In cheque payment is made after presenting cheque to bank DD is given after making payment to bank. Cheque can bounce due to insufficient balance DD cannot be dishonored as amount is paid before hand. Payment of cheque can be stopped by drawee Payment cannot be stopped in DD. In cheque drawer and payee are different person. In DD, both parties are banks. 14. Difference between NBFC & Bank? Meaning An NBFC is a company that provides banking service to people without holding a bank license Bank is a government authorized financial intermediary that aims at providing banking services to the general public. Foreign Investment Allowed up to 100% Allowed up to 74% for Private Sector Banks. Payment and Settlement system Not a part of system. Integral part of the system. The Reserve Bank of India has brought a new methodology of setting lending rate by commercial banks under the name Marginal Cost of Funds based Lending Rate (MCLR). It has modified the existing base rate system from April 2016 onwards. – As per the new guidelines by the RBI, banks have to prepare Marginal Cost of Funds based Lending Rate (MCLR) which will be the internal benchmark lending rates. Banks have to set five benchmark rates for different tenure or time periods ranging from overnight (one day) rates to one year. 16. Why the MCLR reform? At present, the banks are slightly slow to change their interest rate in accordance with repo rate change by the RBI. Commercial banks are significantly depending upon the RBI’s LAF repo to get short term funds. But they are reluctant to change their individual lending rates and deposit rates with periodic changes in repo rate. Whenever the RBI is changing the repo rate, it was verbally compelling banks to make changes in their lending rate. The purpose of changing the repo is realized only if the banks are changing their individual lending and deposit rates. 17. How to calculate MCLR? In economics sense, marginal means the additional or changed situation. While calculating the lending rate, banks have to consider the changed cost conditions or the marginal cost conditions. For banks the cost for obtaining funds is basically the interest rate given to the RBI for getting short term funds. Return on net worth – in accordance with capital adequacy norms. 18. How MCLR is different from base rate? The marginal costs include Repo rate; whereas this was not included under the base rate. Many other interest rates usually incurred by banks when mobilizing funds also to be carefully considered by banks when calculating the costs. The MCLR should be revised monthly. A tenor premium or higher interest rate for long term loans should be included. “S4A” new scheme has been introduced by the Reserve Bank of India (RBI) for resolution of stressed assets and bad loans of large projects. The S4A will cover those projects which have started commercial operations and have outstanding loan of over Rs.500 crore. The purpose of the S4A is to strengthen the lenders’ ability to deal with stressed assets and put real assets back on track by providing an avenue for reworking the financial structure of entities facing genuine difficulties. The scheme is an optional framework for resolution of large stressed account. 20. What is mission Indradhanush? Finance Minister in its attempt to revamp functioning of public sector banks has launched a seven prolonged plan known as – Indradhanush. The seven elements include appointments, board of bureau, capitalization, de-stressing, and empowerment, framework of accountability and governance reforms.